I was out of town for a few days and seeing all the pictures of the new kittens made me want to rush right home to my two furballs! I love this cute family. I bet she has some Siamese in her!! (o: ... Beautiful baby! I was thinking that too, it would certainly explain how "chatty" she was in that earlier video. It will be fun to see if her color starts changing. Beautiful big blue eyes and smudgy gray nose....Sylvie you are gonna break the boys' hearts. Aww, how gorgeous are they? She is lovely. Adorable. Star quality! Charlene's little welcome trill was so sweet in the video. She was clearly saying "Here, babies, come to Mama." Paul Newman's eyes have a rival in Sylvie's!!! I was just telling my boyfriend last night how much I loved Sylvie and her lovely blue eyes. 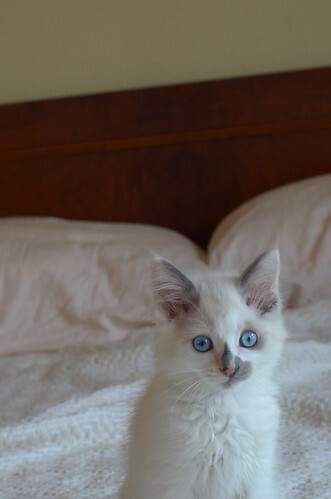 She reminds me of my kitty Sebastian, and I'm anxious to see if she turns out to be a color point. Either way, she's gorgeous and I'm jealous of whomever adopts her. Awww. What a cutie pie. Beautiful! Potter, who has eyes to rival Sylvie's, wonders why hers aren't crossed. Have I told you how much I love you recently? I really do love you. A lot. You are beautiful. I want to adopt you, but I can't. Stupid job search. Because you know what? If I were some place permanently, I'd fly to Seattle to adopt you. If Laurie would let me that is. Not only are you in Seattle, but where you live is my home, well, the Pac NW at least - I'm kinda partial to Eugene. If I adopted you I'd always tell you stories about where you come from. I would't let you forget the PacNW and it's beauty.. see, you'd be adopted into a home of PaNWers, so it really would be the most perfect thing if I could adopt you. But I can't. Please make sure that Butterbean keeps an eye on who Laurie is thinking of letting you go home too. If she doesn't approve, bite them, hard, when they come to meet you. Okay? I trust Ms. Bean's assessment of good homes. The bright blue eyes and the smudgy nose...oh my, I've been slayed by Sylvie Knapp! Oh my goodness what a gorgeous girl!